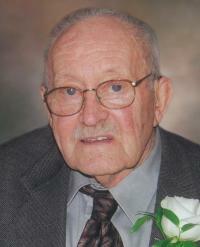 Fred passed away peacefully, to be with his Lord on May 2, 2012 at the age of 82. Fred will be forever loved and remembered by his devoted wife, Jane, of 58 years; children, John (Jeanne), Leona (Harold) Hofstra, Nick (Pauline) and Wilfred (Joanne); 11 grandchildren; 12 great-grandchildren; family and friends. A special thank you to the staff at Salem Manor who so compassionately loved and cared for Fred over the past year. In lieu of flowers, donations may be made to Salem Manor Nursing Home in Leduc. A viewing will take place on Monday, May 7, 2012 from 6:00 to 8:00 p.m. at Foster and McGarvey Funeral Home, 10011 - 114 St., Edmonton. A Memorial Service will be held at Ebenezer Christian Reformed Church, 49257 Range Rd. 250, Leduc on Tuesday, May 8, 2012 at 1:30 p.m. Our lives are tied together with the heart of happy memories, the joy of special moments and love that will last forever.